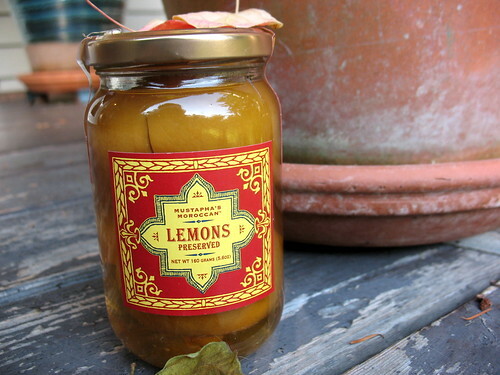 Preserved lemons are common in African or Moroccan food, and while you can make them at home yourself, it's possible to also buy them. The jar in the photo above was given to me last fall and while I wasn't so sure what to make with it, I kept it until I found just the right recipe. A little salty, a bit tart, but still with a lemony flavour, they are really very interesting. Still, I reduced the amount used in this recipe to one since my guys aren't that adventurous with their food. While the resulting dish wasn't that pretty (below), the flavor was incredible! There isn't a lot of sauce but the chicken breaks down into tender pieces, and spooned over rice, this was a dinner to remember. I took the leftovers to lunch the next day and they were even better. In a large, deep skillet over medium heat, warm the butter and oil together until the butter is melted and bubbly. Add the chicken thighs, rounded side down, and cook until browned. Flip over and brown the other side. Remove chicken pieces to a plate and set aside. Using the same skillet, sauté the onion and ginger together until translucent. Add the turmeric and cinnamon, stirring for another minute to let the flavors develop. Stir in garlic, parsley, and cilantro. Cook, stirring around, for a bit until you can smell the garlic cooking. Watch carefully because you don’t want the garlic or bits on the bottom of the pan to burn. If it starts to Stir in the wine, moving it around to scrape up the brown bits stuck to the bottom of the pan. Add the chicken broth and give it a good stir before adding the chicken thighs back to the pan. Bring the mixture to a boil and then turn it down to low and cover. Simmer the mixture for about 30 minutes (45 for bone in thighs), until the chicken is cooked through. Stir in the preserved lemon and olives and bring up to a bubble once again until warmed through. Serve with rice, spooning juices over top.